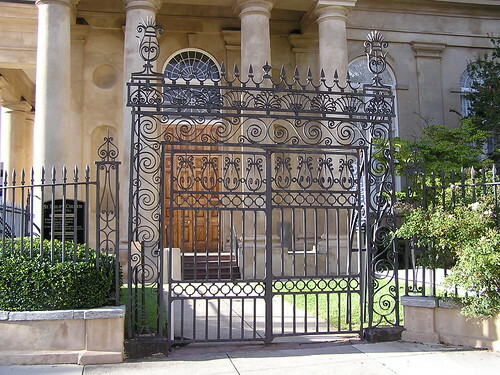 According to Alston Deas, the author of the first published study of Charleston ironwork, these gates at St. Philips Episcopal Church on Church Street are probably among the oldest examples of the craft in Charleston. These were installed following the completion of a previous church building on this site sometime after 1730. The gates were probably surplus or salvaged from another project in England or France and later exported via a merchant ship to the growing colonial capital. The shell design in the decorative lentle above the functional gates is very similar to designs found in the ironwork of Bordeaux and La Rochelle which date from the late 17th century. The cockel shell design has strong associations with northern and western European port cities such as Bordeaux. Bordeaux and La Rochelle, on the Atlantic coast of France, both had strong cultural and economic ties to Charleston starting in the late 1600's. The shell symbol was also associated with the major pilgrim routes that for over a thousand years converged in Bordeaux on the way to one of the principal religeous shrines among medieval Christians, Santiago de Compostela or the Shrine of St. James, in NW Spain. Even though greatly removed by time and geography, distinctive cultural markers of medieval Europe continue to surface in the details of Charleston. This is the evidence of many links to overlapping, yet often conflicting, origins of Charleston's people and their tastes. This becomes proof that wealth and its symbols were neither unique to local conditions nor were they independent of outside influences of which well traveled Charlestonians were quite familiar. All of what was and what remains here has always been rooted in other places though it might have been adapted to local conditions. As throughout the history of Charleston, even as it was emerging from its frontier beginning, architectural details were deliberately intended to be symbols of wealth, power and politics. As such these symbols, and all the ideas they represent, can be used to measure and magnify the economic and cultural evolution of a unique American city. St. Philip's Churchyard, Church Street, Charleston, SC. Photo taken 31 July 2004.